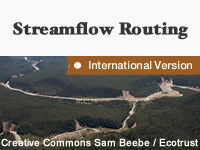 Streamflow routing provides a set of methods for describing and predicting the movement of water from one point to another along a river. Typically, this process involves predicting the shape of a hydrograph downstream from a particular location in a channel, reservoir, or lake. This first requires an understanding of the basic flow regimes and how water is stored and released within a channel. From there, information and calculations based on flow and channel bed characteristics are implemented in hydrologic routing methods, which are storage-based, and hydraulic routing methods, which utilize fully-dynamic equations. This module offers a thorough introduction to these routing concepts and processes through illustrations, animations and sample exercises, with a primary focus on hydrologic routing methods. Unfortunately not a lesson that I have got on with. Terms are used in the prose before they are explained. Also the quiz questions had questions which I could not truly answer knowingly from reading the information given by the lesson. allover topic explaination was so perfect but if someone is fail to give correct answer of any question that means he/she could not understand that point properly.when once quize completed and result come out with score and answer right/wrong page,please tell us the right answer if ans is wrong. Interesting questions. Really required intuitive thinking. This Lesion is Department of Meteorology and Hydrology is very important. This lesson is very useful for Hydro logical Division. This week lesson are very useful for flood forecasting in my country. This week lessons are very useful and interesting .And than this model is very improved for flood forecasting in my country. Was a good exposure to learn. There are aspects of this lesson I would deem as above the introductory level with respect to Hydrology. Its' interesting to learn new things,understanding & thereby upgrading one's knowledge. Excellent. Explained the difficult concepts in simple steps. Presented in a simple manner for universal comprehension. Flood routing subject is complex . But presented nicely.